An upcoming event, co-presented by Artists’ Legal Outreach, the Association of Book Publishers of BC, and McMillan LLP, will discuss issues around fair dealing and copyright. 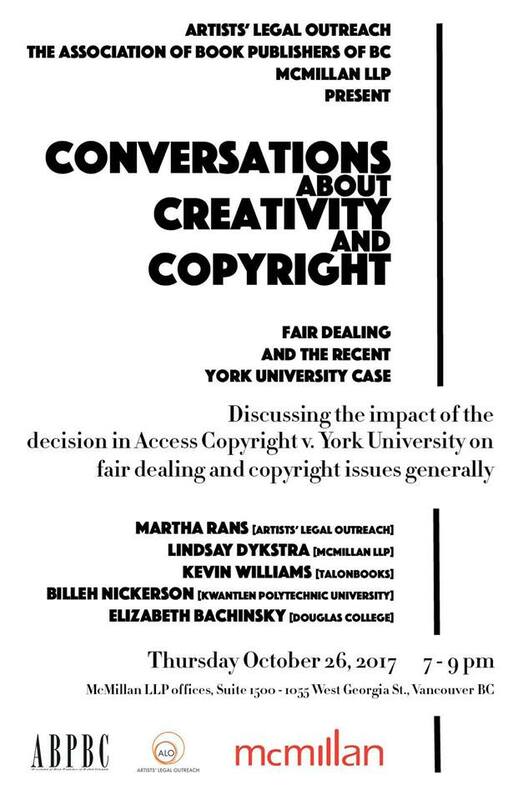 "Conversations About Copyright and Creativity: Fair Dealing and the Recent York University Case" will dive into the impacts of the decision in Access Copyright v. York University. The event takes place October 26 from 7:00 - 9:00 p.m. at the McMillan LLP offices (1500-1055 West Georgia St.) in Vancouver. Presenters include Martha Rans (Artists' Legal Outreach), Lyndsay Dykstra (McMillan LLP), Kevin Williams (Talonbooks), Billeh Nickerson (Kwantlen Polytechnic University) and Elizabeth Bachinsky (Douglas College).